The tailbone is the small bone at the bottom of your backbone, or spine. 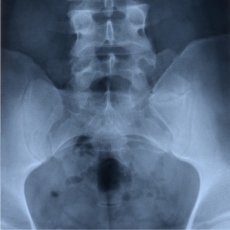 Tailbone disorders include tailbone injuries, pain, infections, cysts and tumors. You rarely break your tailbone. Instead, most injuries cause bruises or pulled ligaments. A backward fall onto a hard surface, such as slipping on ice, is the most common cause of such injuries. Symptoms of various tailbone disorders include pain in the tailbone area, pain upon sitting, pain or numbness in the arms or legs due to pressure on nerves in the tailbone area, and a mass or growth you can see or feel. Article: Comparison of Three Surgical Techniques in Pilonidal Sinus Surgery. Article: Pit-picking resolves pilonidal disease in adolescents.